Meghan wore black and white separates for today’s Invictus Games reception hosted by Prime Minister Scott Morrison. More from a Rebecca English story for The Daily Mail. One source told Mail Online it wasn’t that the duchess was feeling ill, but that they were trying to ‘pace’ her given how many engagements they have coming up. The consensus seemed to be the late night last night took a toll, and the Duchess was a little tired. Because of the severe weather the opening ceremony ran more than two hours late. 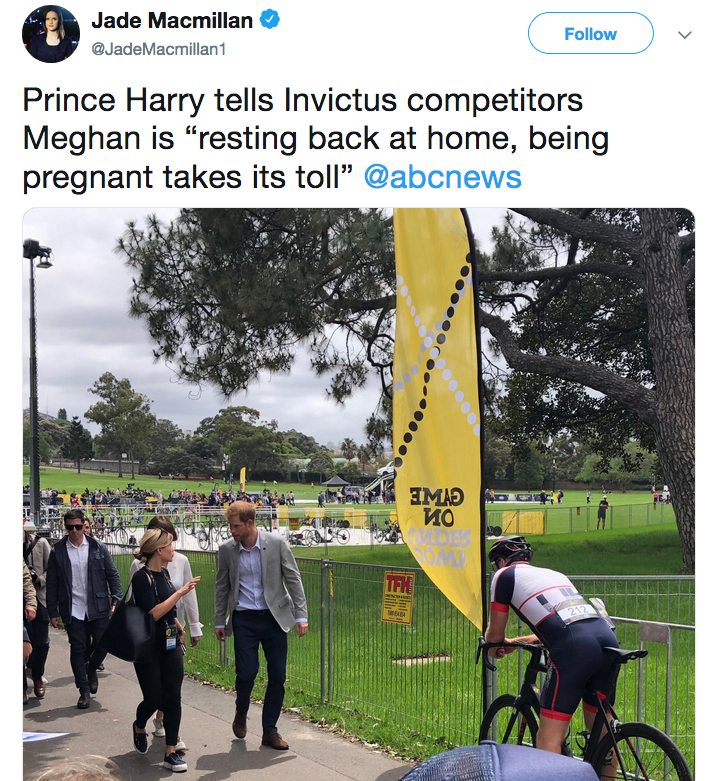 Prince Harry told Invictus competitors that Meghan was “resting back at home”, adding: “Being pregnant takes its toll”. 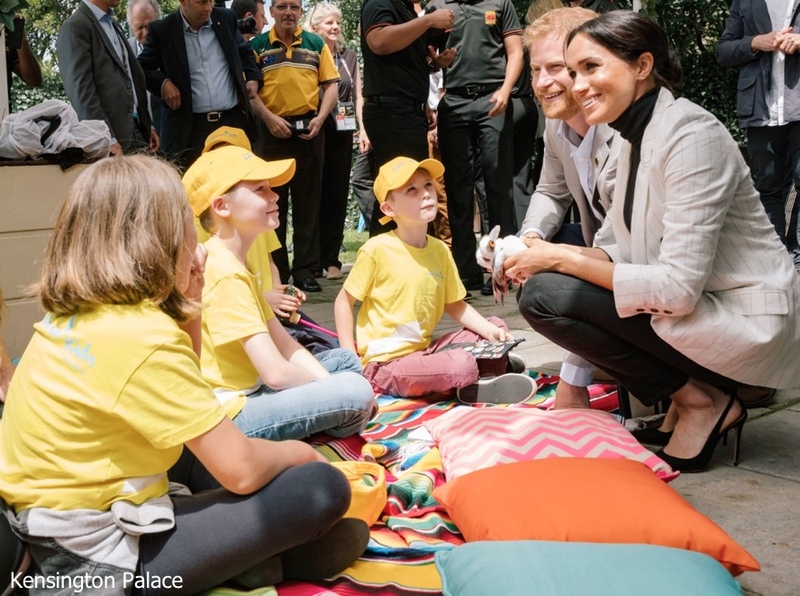 They will consider how much of the Fraser Island programme the Duchess will be able to do. There are concerns over the terrain of the sand island, where journeys involve a bumpy car ride which often leaves tourists feeling unwell even without the extra element of pregnancy. Midday there was a little more clarity on Meghan’s situation. The Duchess did join Prince Harry for a lunch reception today. Guests included Invictus Games competitors, their families and other attendees. 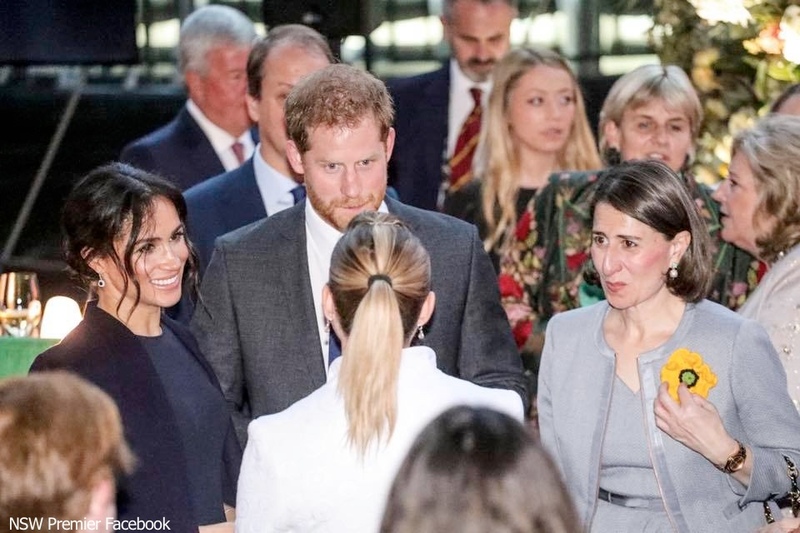 Sam Buckingham-Jones of The Australian tweeted a video of people eager to see the Duke and Duchess arriving for the engagement. The event was hosted by Australian Prime Minister Scott Morrison. The reception was at the city’s central parkland, The Domain. The Duke and Duchess being welcomed into the reception. The Prime Minister addressing the guests. 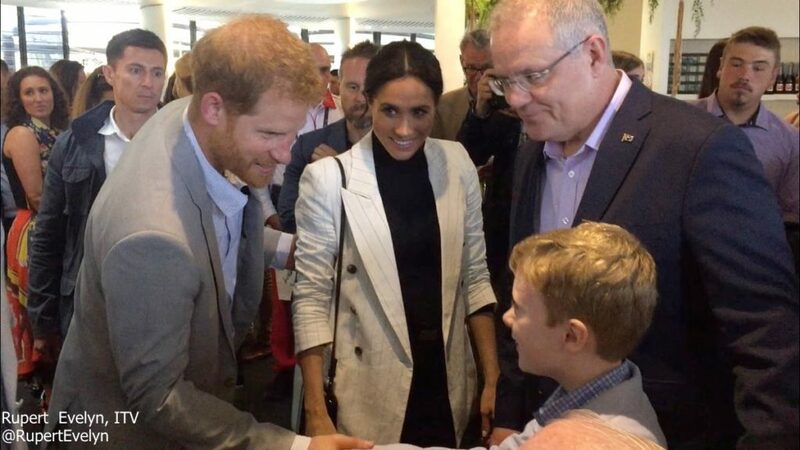 In this photo it looks like the PM might be introducing the royals to the young man seen in lower right. 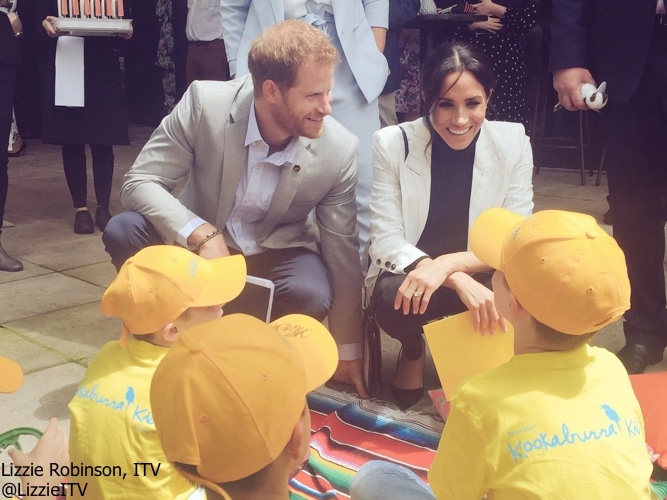 Here you see Meghan and Harry at the reception, meeting children being supported by the Kookaburra Kids Foundation. 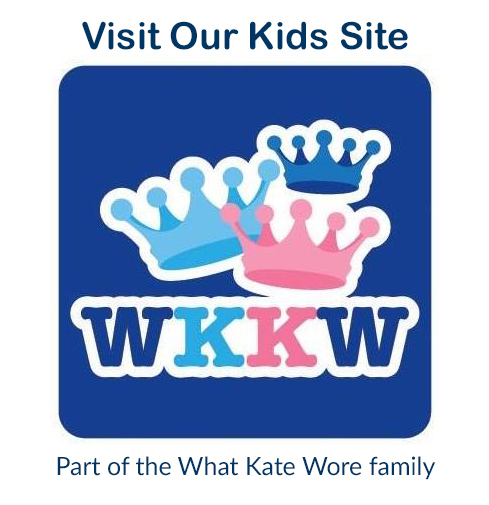 The charity supports children living in families affected by mental illness. Our thanks to Lizzie Robinson of ITV for sharing photos from today’s reception. 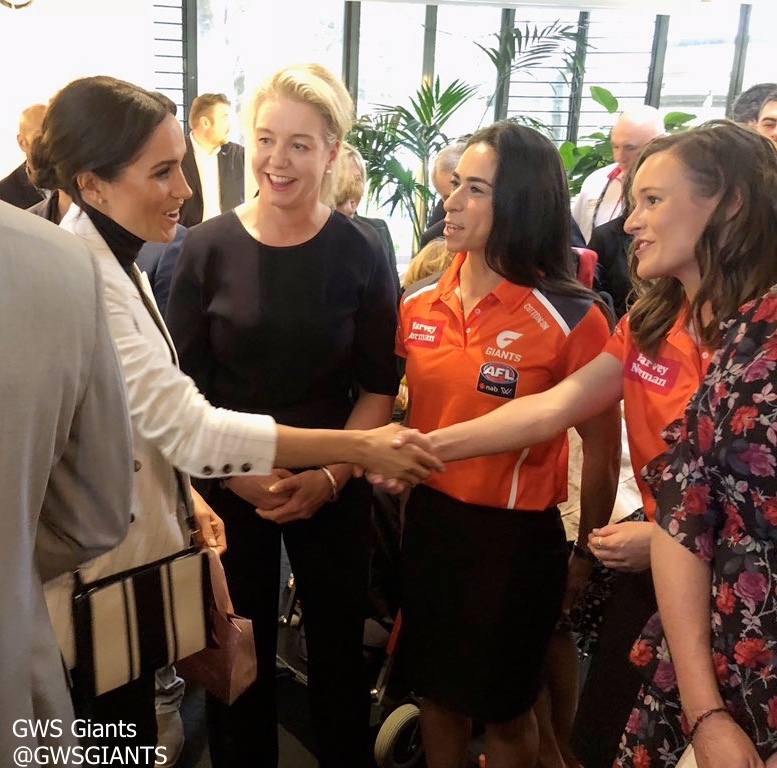 Meghan and Harry also met captain Amanda Farrugia and vice-captain Alicia Eva of the Greater Western Sydney Giants in the AFL Women’s league. the GIANTS are playing host to Invictus Games athletes as they use the club’s facilities in preparation for the Games. 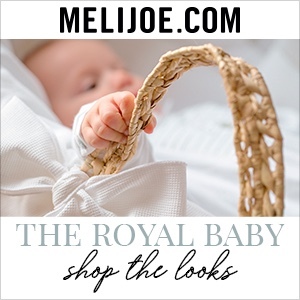 They had goodies for the Duke and Duchess, as well as Baby Sussex. 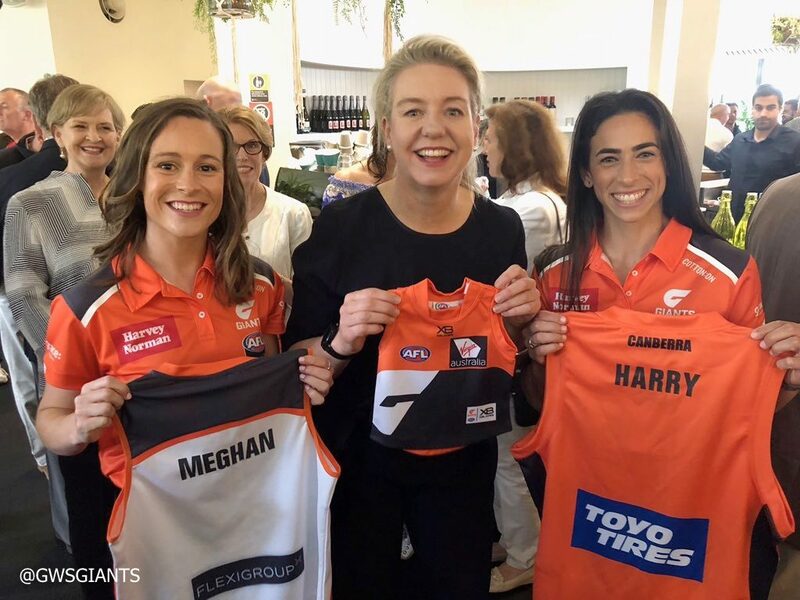 I believe the woman in the center is Senator Bridget McKenzie. Farrugia said while the invitation was a great honour for her and Eva, it was also a fantastic acknowledgement for elite female athletes. 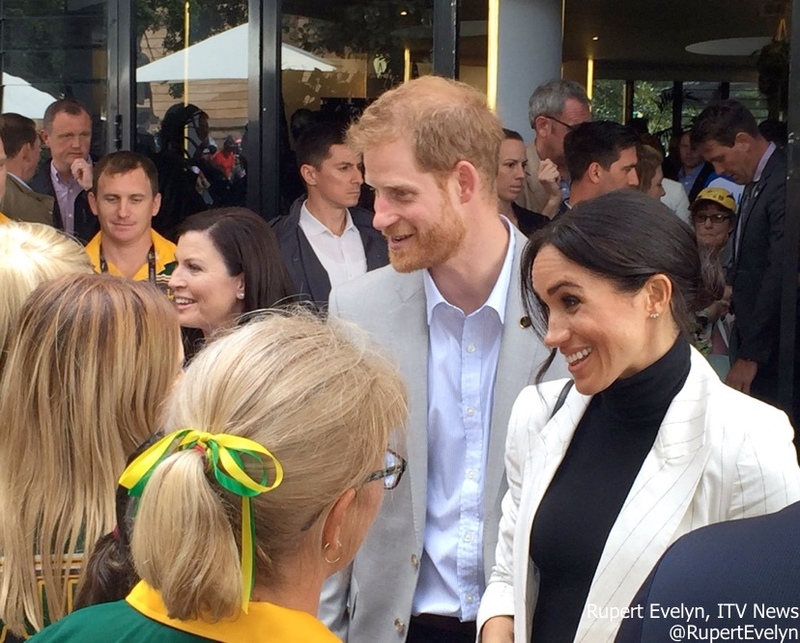 “It’s almost an acknowledgement that female athletes exist in Sydney, being equal to all the males that have been invited to represent their sport (on royal visits) in the past. If you guessed that the gifts would include a tiny uniform jersey, you are a wise royal gift giving observer, indeed. Officials say Meghan will attend the sailing competition this afternoon as planned. Also today, a quick follow-up to our coverage of Tuesday’s reception at Admiralty House. We saw photos of Meghan chatting with singer-songwriter Missy Higgins, talking about her new baby. Earlier this week Ms. Higgins posted a photo from the event on Instagram saying “what an honour to meet the beautiful Duchess today! I said I felt sorry for her having to do all these meet-and-greets while 4 months pregnant! What a trooper!” Our thanks to Michelle at Perths Fashion for letting us know about the Instagram post. From what we could see it looks like the Duchess wore her Aquazzura Deneuve Bow Pumps. 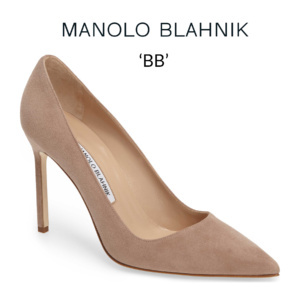 The shoe is a classic point toe style, side cutouts at the heel and the bow at the back ($750). 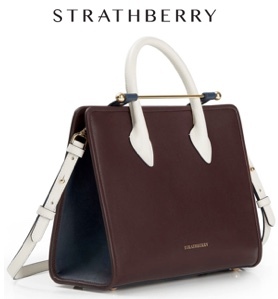 It is available at Aquazzura and also at Harvey Nichols. 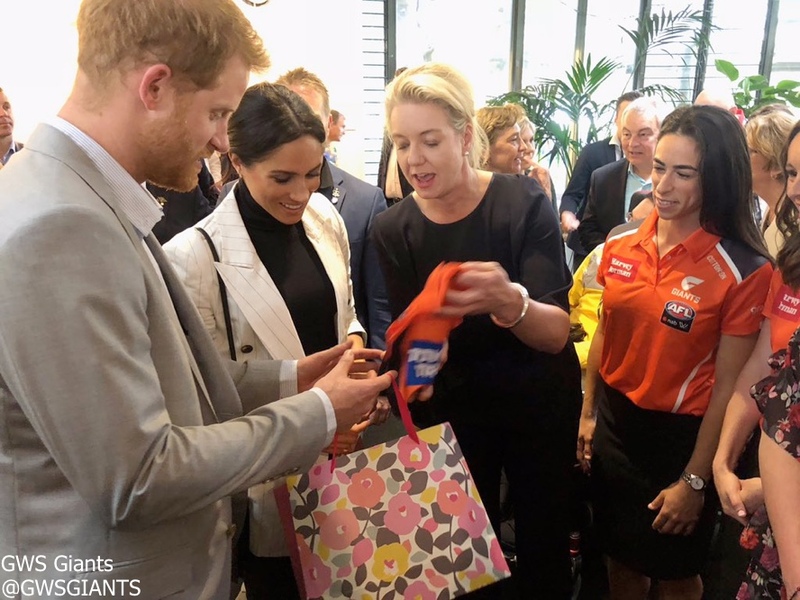 Meghan brought back the Oroton crossbody bag we first saw at the April Commonwealth youth forum. 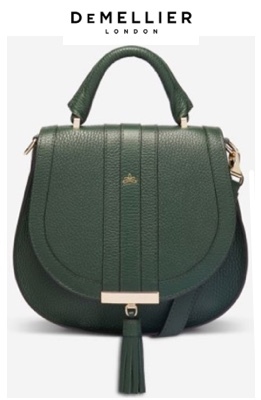 The Australian-based label says the bag will be available online again sometime this month. The Duchess was wearing a new (to us) pair of earrings. 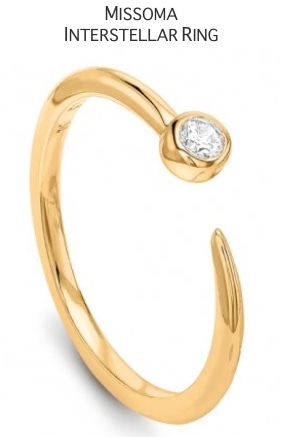 They look like they *might* be the Natalie Marie Diamond Sun Studs ($2450 AUD, roughly $1745 at today’s exchange rates). We are looking for a better photo so we can do a good side-by-side comparison. We are still sorting out Meghan’s jeans, turtleneck. We have more information and photos to share, and will be updating shortly! I mean, there’s nothing to object to here. But I can’t help wondering, why bother packing two different white blazers and two different pairs of black (basically) slingbacks with bows? If it comes to that, I prefer the Altazurra blazer, and while I absolutely adore these Aquazurra Deneuves and will forever, I prefer the lower heel of the Millies with skinny jeans. I like the look of the black turtleneck, but I was surprised to see it, as it’s spring in Australia, and this looks rather bundled-up. What say you, Aussies? Weather- and season-appropriate? This Aussie says that yes, she does look a bit too bundled-up. But as I said in another post, the thing about the weather in south-eastern Oz at this time of year is the changeability (top temps in Melbourne where I live can be anywhere from 14 to 40 degrees Celsius). This would have been a very hard trip to pack for, so perhaps Meghan is having to compromise and adapt outfits on the run. Especially as her small, but growing baby bump may have rendered the odd pair of capri pants just a tad too tight to be seemly. 76 events in 16 days was just too much. The schedule should have been modified as soon as the pregnancy was revealed. The additional concern about the Zika Virus should be taken into consideration. I suspect that the respective governments have put a lot of time and money into this royal tour which everyone involved is considering. I think these concerns are going to over shadow this tour. Best to have her rest and out of danger. I know that women work long, hard hours without proper health care all the time, but let’s face it, if they had a choice they would not. She looks great though. Not much variety in outfits, but right now I am not caring that much about the outfits. So thankful that Harry convinced Meghan to scale back her appearances this upcoming week. I find it very admirable of her to want to stand by her commitments but the schedule was confirmed before her pregnancy was made public. She, and the baby, needs some rest. I love her outfits for the reception and for the water event. But there’s one thing I am curious about….does Australia not have sidewalks? It seems poor Meghan is always having to walk on the grass in her heels. That’s a hard thing to do; and that, in itself, can wear one out! God bless the ‘three’ of them God! Yes, we certainly do have sidewalks in Australia, although we usually call them footpaths. Not every street has them, however, and although I’m from Melbourne and can’t comment on Sydney’s situation, they tend to be less common in the densely populated, older, inner-city areas. I think poor Meghan has been a bit unlucky, or perhaps it’s easier for photographers to get a clear shot when she’ walking across open areas such as lawns. Smart move to assess the next couple of days of the Royal tour now that the INVICTUS games have officially opened! It’s reassuring to know Meghan’s schedule is fluid and flexible and being renegotiated… for her sake and the baby’s. I don’t know about you but I’m constantly, especially as a mom, needing to be flexible and willing to re-negotiate in order to accomplish goals. Love the 2nd from the top photo where Meghan is taking long strides while talking to Harry! 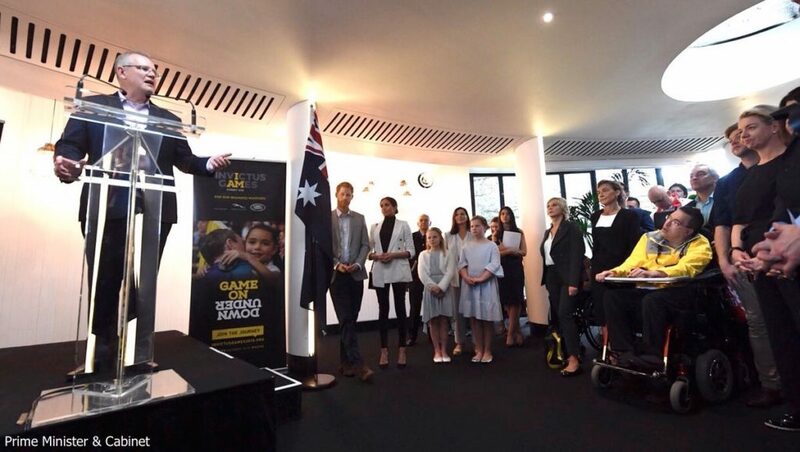 Surrounded by “elite female athletes” (love that description); Kookaburra kids, Senator McKenzie (fashionably dressed in black trousers and elbow length top); INVICTUS families and competitors; etc. Meghan looks fit and fresh and her ensemble fun and sporty chic. The Orton crossbody bag paired with the L’agence blazer is a knockout. 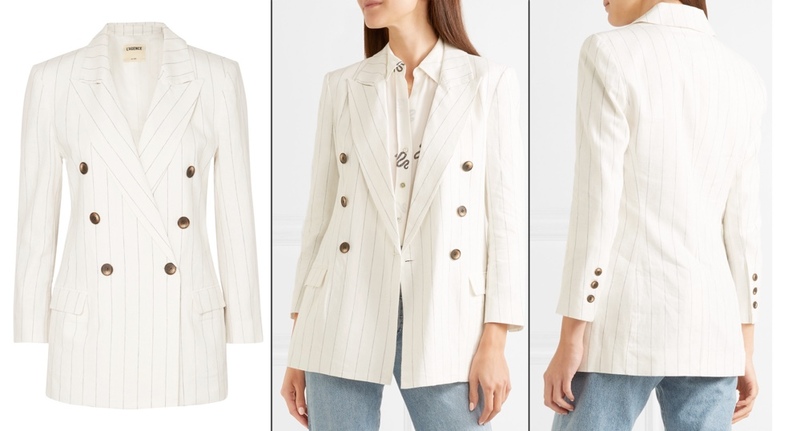 I love pinstripe linen and this L’Agence jacket is a topper. I like the way Meghan has upcycled a look of cream jacket with black jeans and top by opting for the tasteful pinstripe this time. Looks like boxy jackets and shoulder pads are coming back and Meghan is working the shape to her advantage, skimming her hips nicely and making her torso longer. I’m not a fan of really big boxy shapes as they dwarf me, but this one is well in proportion and Meghan has the elan to carry off unusual shapes. It’s lovely to see the Oroton bag again, one that she matched with stripes last time though it surely would look good against solid colour. But on this occasion it helps tie the black separates in with the pale linen very nicely. I also think Meghan is well able to carry off slingbacks with skinny jeans, something that can look tacky on some. I’m impressed she’s still up to showcasing killer heels in pregnancy and these Deneuve Bow Pumps are very pretty. Love those earrings and glad to see Meghan looking refreshed. Knowing she’s having to take extra care of her health leaves me not caring how much black and navy she wears any more, just as long as she stays well. If I had my way she’d be wrapped up in cotton wool and on the plane home. Kudos to her for carrying on. The 4 months pregnant comment from Missy makes me wonder if Meghan and Harry knew about the pregnancy when they agreed to this tour schedule. I’ve seen a lot of reporters talking about the jet lag so I wish they’d been given more of a rest after arrival to adjust to the time zone. Still a rigorous schedule but that would have helped. I wonder if these are repeat jeans from earlier in the week or another pair. Hard to tell from photos but these seem more charcoal to me than black. I think “pacing” is the perfect word to describe it. After one unexpectedly late nights, they prob figured it was better to give her a little break, rather than keep pushing and have her arrive in the next country (can’t remember if it’s NZ or Fiji?) even more wiped out. Her outfit today looks nice. It’s not the most unique or cutting edge outfit but it seems professional and appropriate. I think I need an oversized blazer in my life…. I was thinking the same thing for the last few weeks. I haven’t worn a blazer in a decade, but I think it’s time! Thank goodness they decided to modify the schedule. Even I’m tired to follow up with everything and I’m not the one participating! Meghan needs to take care of herslef and so does the future father. I love how generous they are with their time and energy they restlessly give to the others, but we all need to recharge our batteries. I’m sure that Prince Henry (really got into calling him that instead of Harry…) will make sure that Meghan rests. It must be hard for an active person to slow down. It’s good that Meghan is taking a small break! I have to say I am so bored with her clothing though. I guess really who decided she needed to be a fashion icon- maybe this is a deliberate choice to keep the focus off her wardrobe and on her work? But that’s the problem Becky, Meghan is not an ordinary professional woman dressing for the office. She is a British royal on an international tour. The whole point of these tours is for royals to promote themselves and the monarchy, representing the Queen in her realms. I don’t want my royals to dress like I do when going to work, that’s not why I pay my taxes for. Can you imagine if the Queen adopted Meghan’s clothing philosophy. there’d be a national outcry. 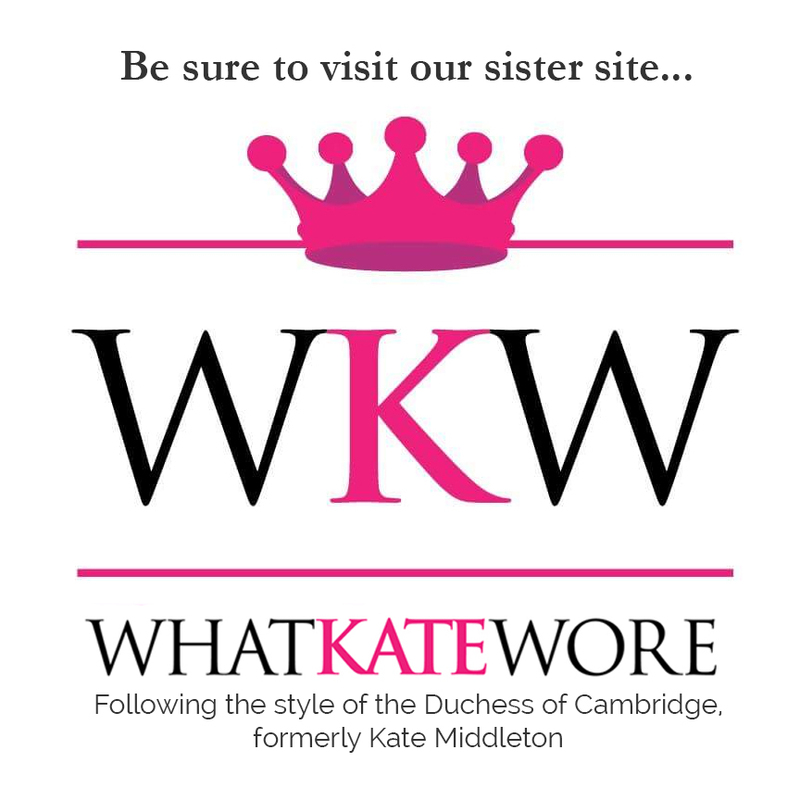 This is a blog about royal fashion, it becomes pointless if there is no fashion to speak of. I agree. While I adore Meghan, closet-wise this tour is a major disappointment so far. She looks lovely at a fairly casual event overlooking the harbour. The dress code called for smart casual and that is exactly what Meg has done. The day was a little cool after all the rain. Love the heels, I never ditched my heels and it is just what you get used too. Although I’m loving getting up every morning on the West Coast to see what Meghan is up to in Australia, I’m glad she’s cutting back a bit. This trip was way too ambitious to begin with. Also, kudos to WMW admin for all the great coverage. 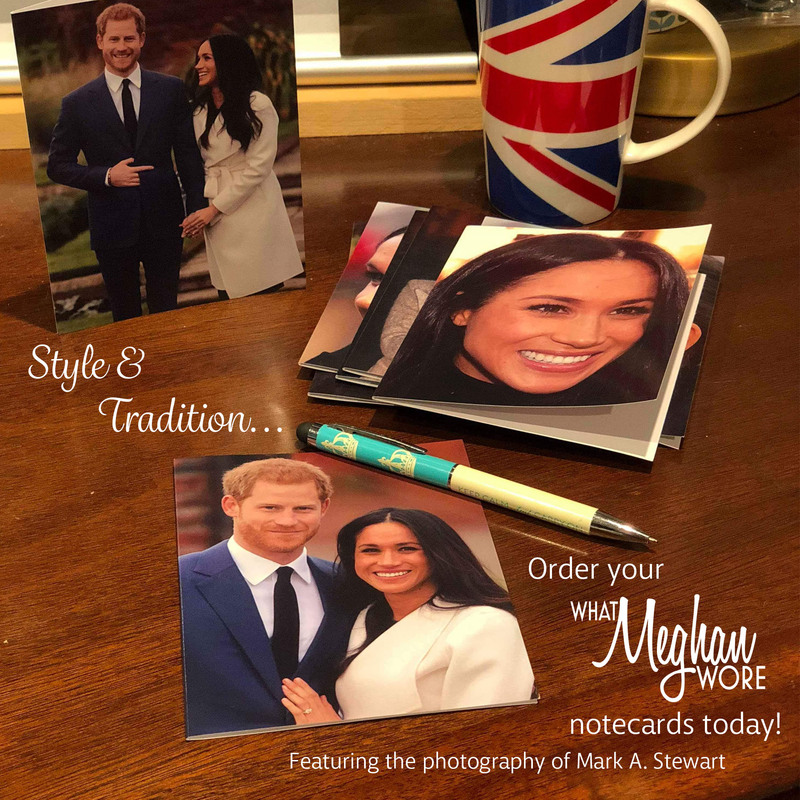 You probably need a break even more than Meghan! It is not surprising that Meghan is cutting back on some of the activities. I wonder who drew up and approved the tour agenda in the first place? To have 76 events in 16 days is insanity. Pregnant or not, the pace is just too jam packed. In a few days Harry might hit a brick wall and be exhausted also. Were I in charge of their schedule, I would be insisting on no more than three events a day…one in the morning, then time off for lunch, one in the afternoon and free time over dinner, one in the evening, but not every evening. That would put it at around 40 events, rather than 76. I’d also be insisting on a day off, mid tour. Harry and Meghan want to meet as many Aussies as possible, but more thought should have gone into the planning. Meghan looks fine today, although like many, I am still waiting to see some colour in her wardrobe. The blazer is attractive and the black and white bag really compliments this outfit . Once again I find the stilettos too fancy to wear with jeans. 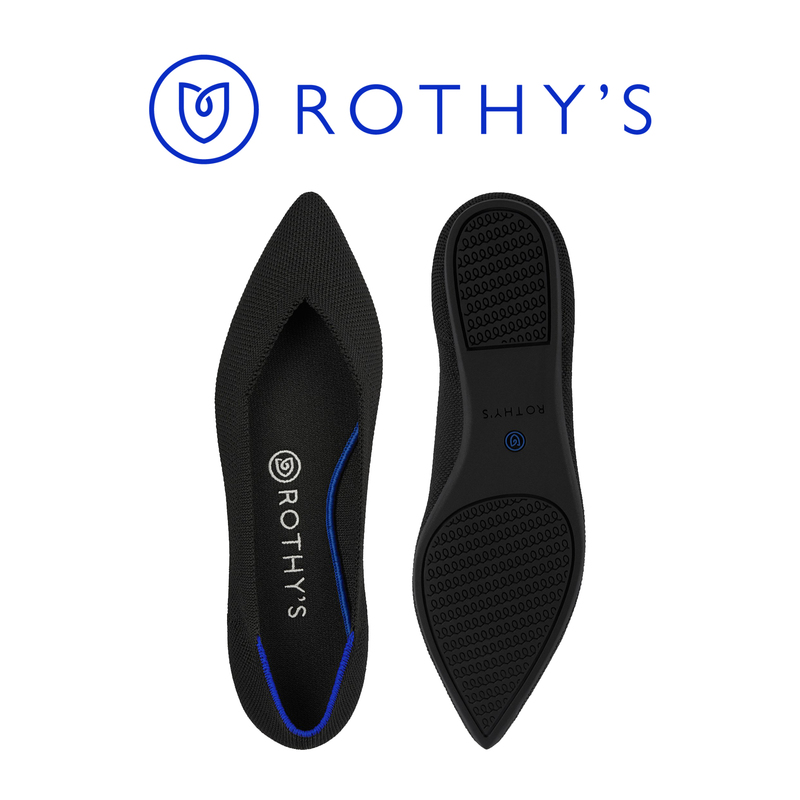 If Meghan is tired, perhaps a low heel shoe would be more comfortable and easier on her. I agree 100% Bonnie! I imagine two factors have to do with this jam packed schedule – first, Meghan is such a hard worker and wanted to prove herself as she always did, second, pregnancy was not taken into account. Judging from her pre-engagement flying back and forth to see Harry, she must be an experienced and persistent traveller, not suffering so much from jet lag. But pregnancy might have changed it a bit. But still, I agree that this was too much from the beginning! Also agreed on the lack of colors in her wardrobe. Personally, I do not like the black turtleneck, it looks too sombre and heavy and washes her out IMO. It was always too much for anyone, pregnant or not. I’m sure she wasn’t pregnant when planning began, so a big problem was they had committed to all these engagements, planning was well underway, and they didn’t want to disappoint people. But, still, at its heart, it’s a crazy schedule. The crowds alone are exhausting. I often think, in terms of Meghan’s shoe choices, that surely there’s an option somewhere between four inch spike heels and sneakers. When I see her (or ANY woman — Melania Trump, for instance) tromping across grass in spike heels, it just looks ridiculous, not to mention potentially dangerous. I know I’m commenting before the full post is up! That’s ok. It sounds honestly like Meghan is raring to go to all the events and nervous Harry wants her to slow down, given this is her first pregnancy. Since we know Meghan is pretty athletic thanks to past pictures of her in various yoga poses (she can do a headstand I’m pretty sure!) from her Instagram, I think she can probably handle most of it. The more active a woman tends to be, the more she can tend to do during pregnancy (from the women in my life I’ve known who have been pregnant, I don’t have kids!). But it can’t hurt to give her some time off here and there. As for this outfit, it looks almost exactly like the outfit she wore yesterday (today? the time difference is screwing me up) but a different blazer. She sure has a uniform! I don’t think I like this blazer as much, not sure why. It must be chilly if she’s wearing a turtleneck? 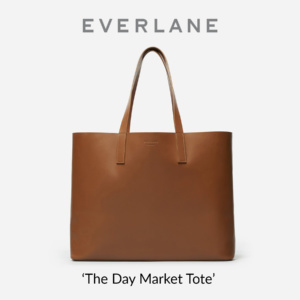 Love the bag! I didn’t remember it from the last outing. What Meghan Wore is providing amazing coverage of this epic tour. I’m sure Meghan isn’t the only one who needs a rest!